ARTICLE CORRECTION/NOTATION: The cemetery was not founded or donated by the Schmidt family. Tucked away between acres of forest preserve land north of Oak Forest there rests a tiny bit of history, virtually neglected in recent years except by vandals. Shielded from the view of passersby on 143rd st., by a small lake and a barrier of trees, a cemetery which dates back to the 1830's gives mute commemoration to the area's early settlers. Commonly known as Bachelor's Grove, as is the forest preserve around it, the cemetery offers a striking contrast: a memory of life 100 years ago against the stark modern-day reality of beer cans, litter and discarded junk. Chiseled on grave markers and monuments that have not yet fallen victim to the vandals are the names of some of those first residents-Fulton, McKee, Moss, Heil and Hamilton. Some inscriptions have been rendered illegible by time or wanton destruction. Others have been partially covered with spray paint. The cemetery has become something of a lover's lane over the years besides earning a reputation for being haunted by ghosts. But a certain pristine semblance remains despite these intrusions, waiting for the time, if ever, when the virtually abandoned graveyard is restored. The site was one of the few tracts of land in the area not acquired years ago by the Forest Preserve district. Clarence Fulton, 71, of Tinley Park, a descendant of an early resident of the area, is one of the cemetery's remaining trustees. Fulton, whose son Ken is a Tinley Park trustee, said attempts have been made in recent years to care for the land but have been proven futile. The Bremen township board was asked in 1967 to pay for caretaking and the installation of a fence around the cemetery, but that was turned down, Fulton. He admits he would like to maintain the property, but concedes he "can't get around enough these days" to do the job. The land was originally donated for use as a graveyard by an early farmer named Schmidt and was later partially acquired by Fulton's grandfather. "He was a farmer and came to this country about 1840 from Belfast, Ireland." 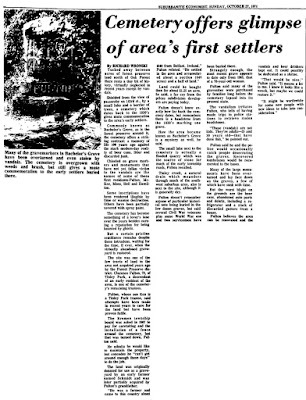 Fulton related, "He settled in the area and accumulated about a section (640 acres) and a half of land." Land could be bought then for about $1.15 an acre, he said, a far cry from the prices subdivision developers are paying today. Fulton doesn't know exactly how far back the cemetery dates, but remembers there is a headstone from the 1830's marking one grave. 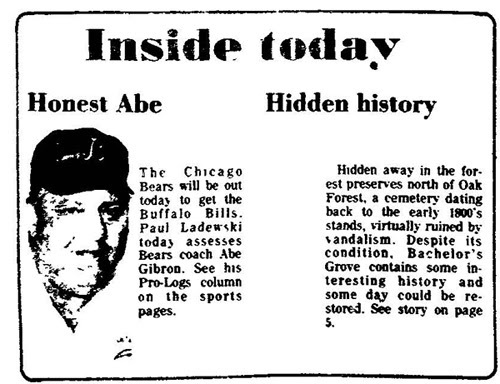 How the area became known as Bachelor's Grove is a mystery as well, he said. The small lake next to the cemetery is actually a flooded quarry which was the source of stone for much of the early township roads, Fulton recalled. Tinley Creek, a natural drain which meanders through much of the southwest suburban area, also is next to the site, although it is generally dry. Fulton doesn't remember anyone of particular historical note being buried in the few dozen graves, but said several Civil War veterans plus some World War one and two servicemen have been buried there..
Strangely enough, the most recent grave appears to date only from 1965, that os a 78-year-old woman. Fulton said many of the gravesites were purchased by families long before the cemetery lapsed into its present state. The vandalism irritates Fulton, who tells of having made trips to police stations to retrieve stolen headstones. "These (vandals) are not kids. They're adults--25 and 30 years old--that have done this," he pointed out. Fulton said he and the police would occasionally catch people desecrating the graves. Recovered tombstones would be recemented to the bases. Many of the large monuments have been overturned and lay face down on the graves, a few of which have sunk with time. But the worst blight on the grounds are the beer cans, abandoned auto parts and debris, including a refrigerator and a stack of discarded gutters from a house. Fulton believes the area can be renovated and the vandals and beer drinkers kept out. It could possibly be dedicated as a shrine. "That would be nice," Fulton said. "It means a lot to me, I know it looks like a wreck, but maybe we could restore it." "It might be worthwhile for some new people with new ideas to take into consideration."